A huge crowd came out for the game. 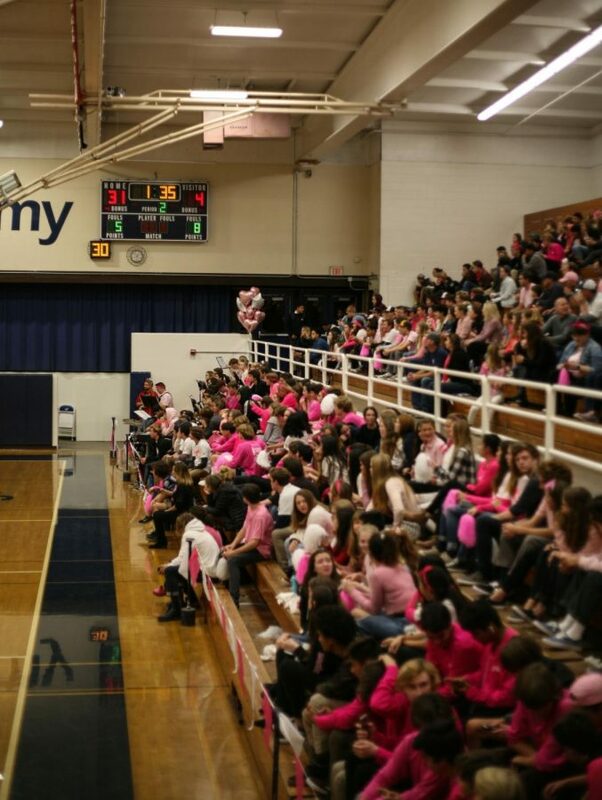 On Friday, the SDA community brought a strong crowd of fans for both boys and girls basketball pink-out games, as this game held a special place in the hearts of SDA community. The game supported SDA’s athletic director Scott Jordan’s wife who has breast cancer, raising money for and awareness about the disease. Students, teachers, parents, and community members came pink-out in pink bandanas, jeans, and shirts, and the basketball parents provided free t-shirts, candy and donuts as well. The fans were not disappointed and nor were the players. Such a connective and heart-felt event resulted in equally exciting games. With a sea of fans for the boys and girls games, both teams agreed that the support was beneficial for their games. “We usually never have that many people at our game, but the energy with everyone there to support us was a huge help. I had more confidence and the team had more confidence,” junior Ryan Adams said. A strong attack balanced by an aggressive defensive effort gave the SDA girls basketball team an overpowering 58-20 victory over Rancho Buena Vista. The Mustangs dominated the court right away with sophomore Tonia Billante opening up the score line for the Mustangs at 2-0 within the first 10 seconds. The Longhorns looked to respond with a run down the court but were stopped by junior Josephine Willard who stole the ball and assisted junior Addison Werbelow in a three point bankshot that pulled the Mustangs to a 5-0 lead. To finish the quarter strong, junior Jacqueline Sedlock faked her way past the Longhorn defense twice to score a total of four points in the last 40 seconds of the game. The first quarter came to a close with the Mustangs leading 20-4. Freshman Ruby Willard kicked off the second quarter by netting her second of two free throws in the first 45 seconds.The Mustangs forced their way to the free throw line on three more occasions and converted two out of seven attempts. RBV found themselves at the free throw line once second quarter but fell short of the basket on two shots. The half ended with a score of 31-8 in favor of the Mustangs. The chanting and ecstatic energy of the crowd grew in the second half, pushing the Mustangs to increase their dominating scoreboard presence. Strong turnovers and three-point shots were the theme of the third quarter and contributed to the Mustangs 37 point lead before fourth quarter. Already having an overpowering 54-17 lead after three quarters, the Mustangs slowed their attack in the fourth quarter. The combined scoring efforts of sophomore Alexa Mendes and freshman Piper Ligotti pulled the Mustangs to their 58-20 victory. The Mustang girls are back in action Tuesday as they head to El Camino for their next league game against the Wildcats. The 7:30 boys game maintained the crowd that came for the girls game, and even saw an increase in fan numbers. Intense and hungry to win, the Mustangs put up a tough fight, but lost the lead in the last quarter of the game losing 48 -57. Mustang lineup consisted of Adams, Y. Arbib, and seniors Jayce Cannon, Alex Bright, and Ronan Arbib, who ended the first quarter with a lead over the Longhorns 14 -12. Back and forth down the court, both teams hustled to attack and defend the hoop in the first eight minutes, shadowing a close match based on the first quarter. The second quarter kicked off with RBV scoring two freethrows, but Adams quickly responded with a two pointer. Sophomore Matthew Naimark scored an all-net three-pointer, followed by cheers and uproarous claps from the pink crowd. Despite falling behind, the Longhorns retaliated with 10 points to lead over the Mustangs 19 -24. Y. Arbib tied the game back up, scoring a two and three pointer with two minutes left in the game. Both teams scored two more points, ending the quarter in a 26- 26 tie. A slew of fouls defined the third quarter, as well as the Y. Arbib scoring seven points. The Mustangs took the lead – 39 -34 – with eight minutes left in the game. Both teams brought the intensity this game, however, the Longhorns dominated over the Mustangs in the last quarter. Adams continued the fight, dribbling around several RBV players and scoring four points in the first three minutes into the quarter. Several free throw opportunities put the Longhorns in a good position, and took over the league with a series of good plays and points. Glistening with sweat, turned into drenched, as players endured working tirelessly. Students and parents joined together stomping their feet, cheering “defense!” Despite R. Arbib scoring the final three points for the Mustangs last three minutes of the game, the Longhorns came out on top with a 57-48 win. The boys final home game is Friday, February 7 against the Sage Creek Bobcats, so come out and support your Mustangs!